I was given a wonderful opportunity recently to work with Offray Ribbon, creating some jewelry pieces for their totally updated website. I've always bought this brand, since it was available in all the local craft shops and is always consistent in color, size, finish, and general beauty. And now it's available online as well, direct from the company. You can learn more about Offray Ribbon here. And guess what? We've been given a coupon code that you can use to online to get 15% off an Offray order from now till the end of November! Details: Use BEADING15 during checkout on Offray.com to receive 15% off one order. Offer expires 11:59 PM eastern time on Sunday, November 30, 2014. Discount excludes applicable tax and shipping costs. Cannot be combined with any other offer. Discount cannot be applied to previous purchases. Subject to change or cancellation without notice. Other restrictions may apply. 2 lengths of 20 gauge bronze wire, 18"
1 length of 20 gauge bronze wire, 12"
12 gauge bronze wire, 8"
3 lengths of 20 gauge copper wire, 6"
1. 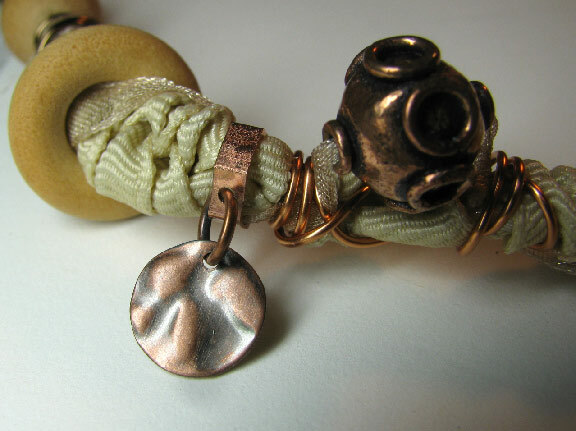 Fold the cord in half and make a lark's head knot around the soldered copper hoop. 2. 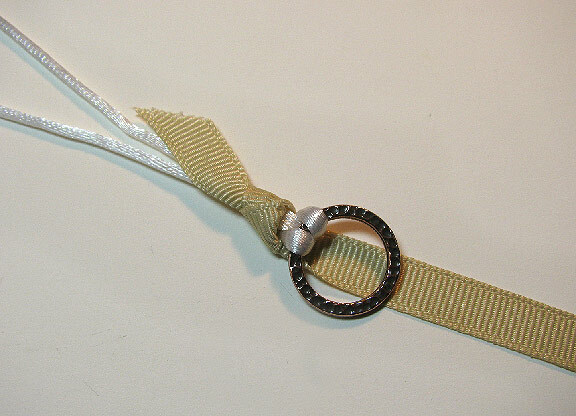 Tie a single knot around both cord strands with the grosgrain ribbon. 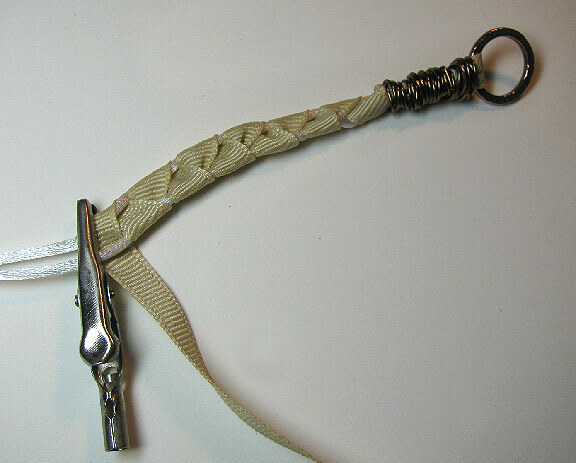 Tie it so that the short end is pointing away from the hoop as shown. 3. Pull the ribbon through the hoop to cover the cords. Wrap tightly several times around the knot and the top of the cords. Use an alligator clip to hold in place for the next step. 4. Bury one end of an 18" length of wire in the ribbon near the hoop. Wrap up and down several times around the ribbon and cords to secure. Finish with the wire down at the end furthest from the hoop, but do not bury the second wire end yet. 5. Wrap the ribbon in a figure 8 around the two cords, keeping the ribbon flat. Do not wrap too tightly. 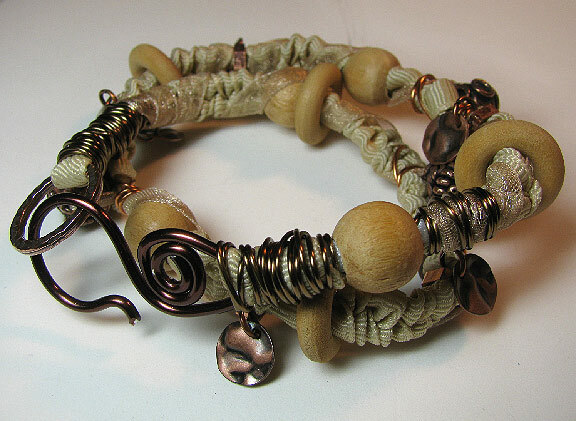 Wrap for approximately 4". 6. 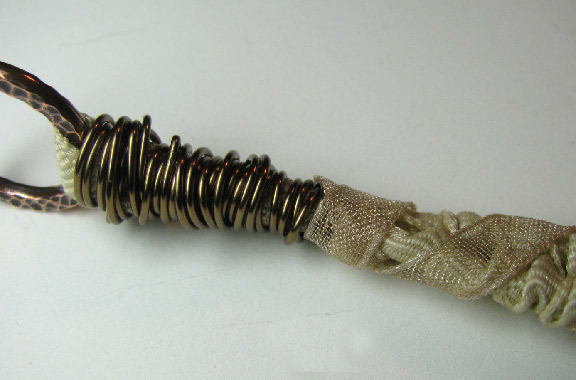 Grasping the bottom twist with one hand, push the wrapped ribbon up towards the wire. The 4" of wrapped ribbon should compact to approximately 2". 7. 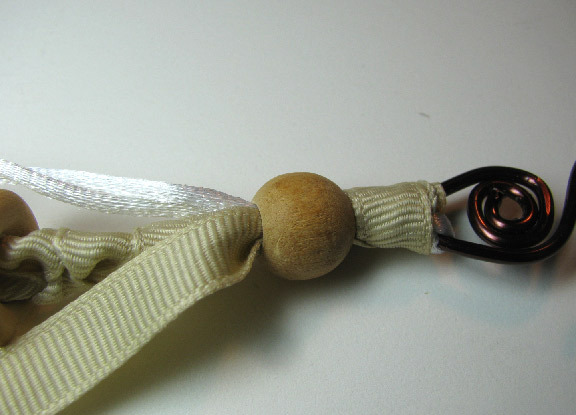 Using a large-eyed needle if necessary, thread both cords and the ribbon through a large-holed round wooden bead. 8. 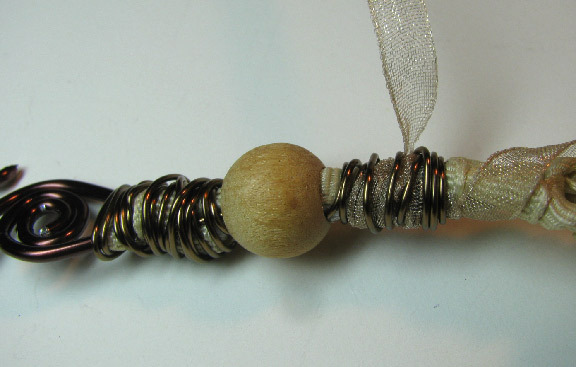 Continue wrapping and compacting the ribbon, adding wooden hoops, copper open hex beads, and more round wooden beads as desired. 9. 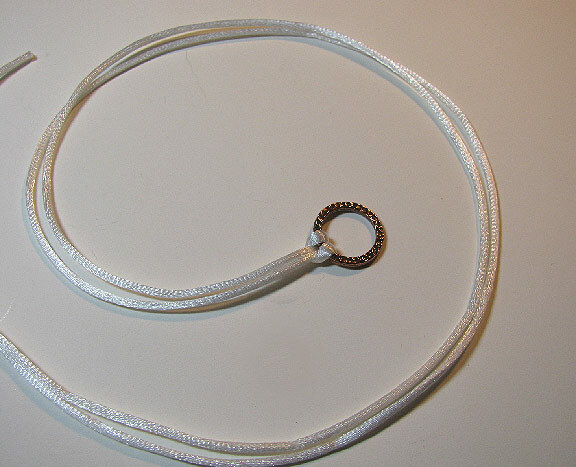 To make a 16" double-wrap bracelet, wrap and compact approximately 14", not counting the end hoop. 10. 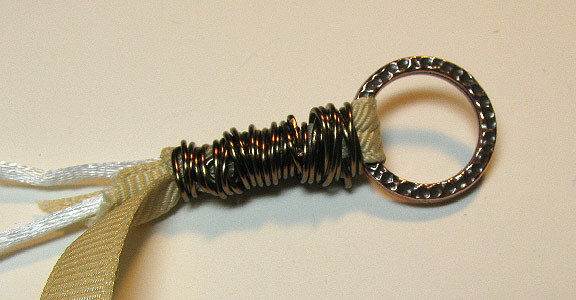 Turn a spiral with 8" of heavy gauge bronze wire. 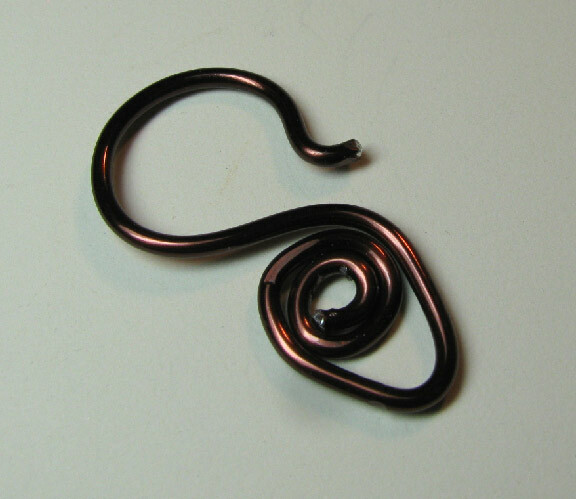 On the last spiral loop, take the wire up and over your round nosed pliers, and then bend the wire by hand to create a pleasing hook shape. 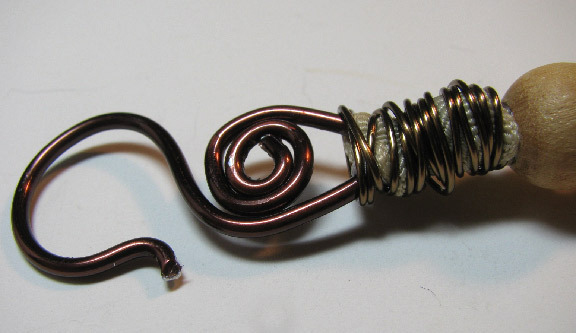 Make a small bend at the end of the hook, and clip the excess wire off. File the cut end smooth. 11. Leaving the ribbon free, thread both cords through the base of your hook, tie a double knot around the cords at the base of the hook, and thread the ends back down through the last bead. 12. 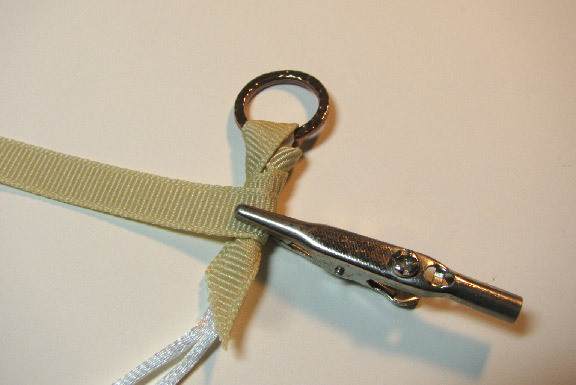 Pull the ribbon through the base of the hook to cover the cords, and wrap several times to cover the knot. 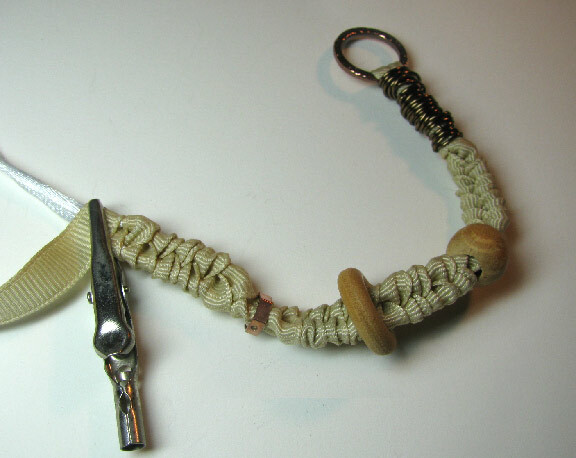 Using the large-eyed needle, thread the ribbon back down through the last bead. 13. 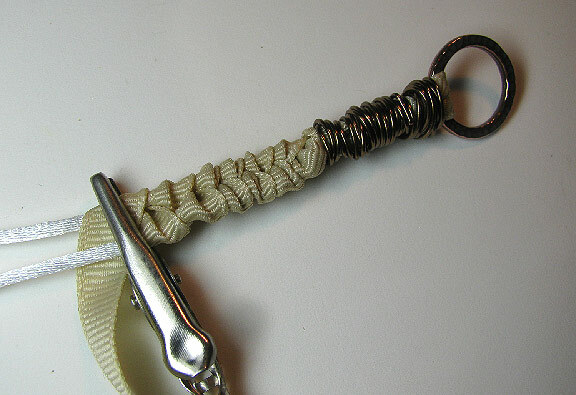 Using your second 18" length of wire, wrap back and forth over the knot and the base of the hook, burying both ends of the wire into the ribbon. 14. Secure the end of your sheer ribbon under the piece of wire you left loose in step 4, and bury the wire end into the ribbons and cords. 15. 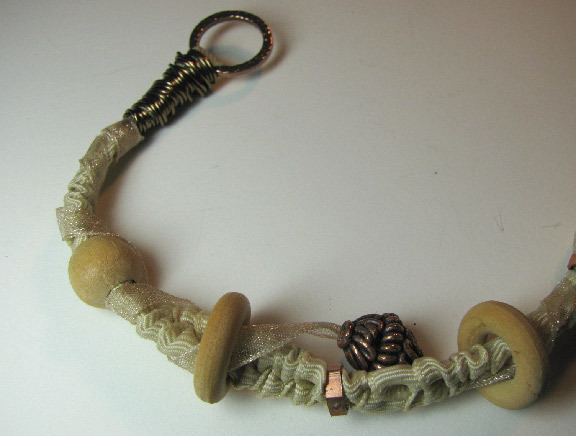 Wind the sheer ribbon around the previous strand, passing over the round beads and through the hoops and open hexes. 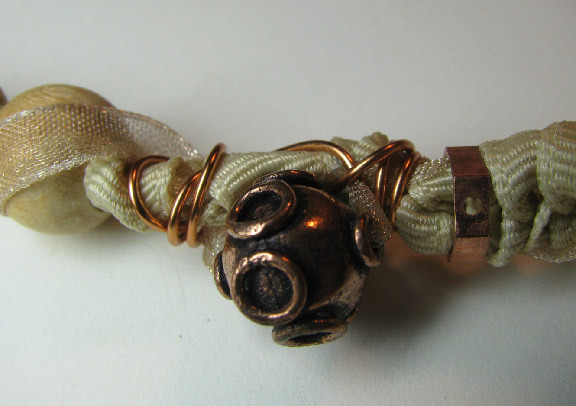 Use the large-eyed needle to add several decorative copper beads along the length. 16. 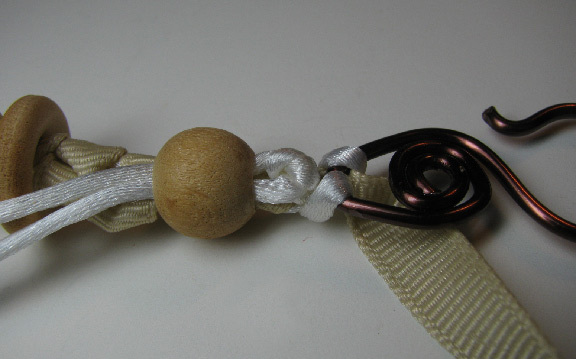 Use the 12" length of wire to secure the sheer ribbon just below the last round wooden bead. 17. 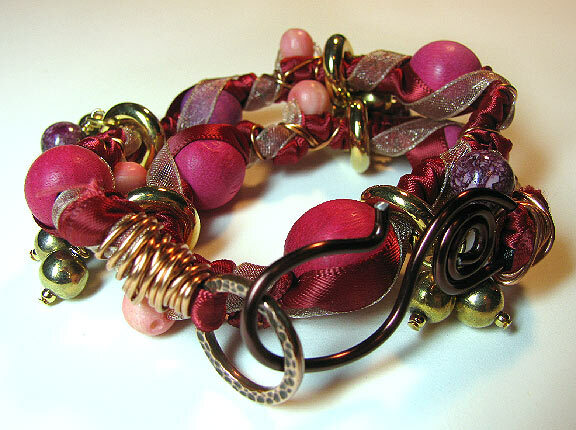 Using 6" lengths of wire, wrap loosely on both sides of each decorative bead, around the sheer ribbon, to keep them from shifting and sagging. Bury both ends of the wire in the ribbon and cords. 18. 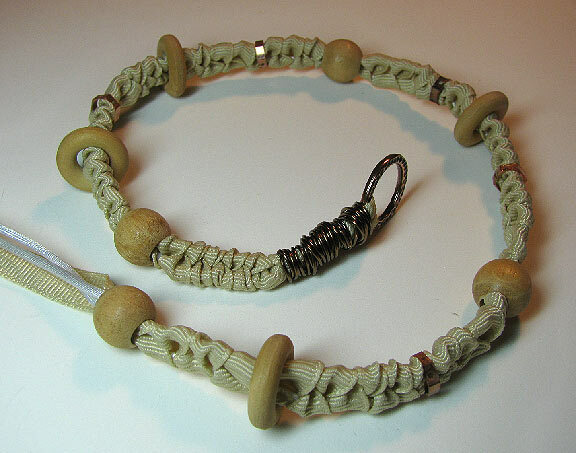 Open 10 jump rings, and attach charms to two holes on each copper hex bead. If your hexes don't have pierced holes, just attach your jump rings around the bead instead. Here's a second bracelet that I made, using basically the same instructions, but taking advantage of Offray's satin ribbon. This post is sponsored by Offray, from whom I have received some of the products in order to create this project for you. Copyright 2014 Cyndi Lavin. All rights reserved. Not to be reprinted, resold, or redistributed for profit. May be printed out for personal use or distributed electronically provided that entire file, including this notice, remains intact. It's lovely, Cyndi. What great Christmas gifts they would make. Thanks for the detail on how to wrap neatly. I love the baubles you've added. Thanks Eileen! You seem to have ESP...according to my brother, my sister-in-law has claimed the red one for Christmas, and has renamed it "MINE"! I love that detail, too. Your instructions are always so great. This one is really beautiful.